For details on FREE DELIVERY to Swift Current and select communities, please see our Policies page. The AIÖ is our leading product – simple, adorable and effective! • Easy to use, the AIÖ is the closest to a disposable diaper. • Omaïki’s innovative design allows you to increase or reduce absorbency, depending on the age of your child, without affecting comfort or drying time. • The detachable insert can be replaced by the Ö.Mega Booster for older children and heavy wetters. • The outer shell is made of soft, breathable, waterproof fabric (PUL). 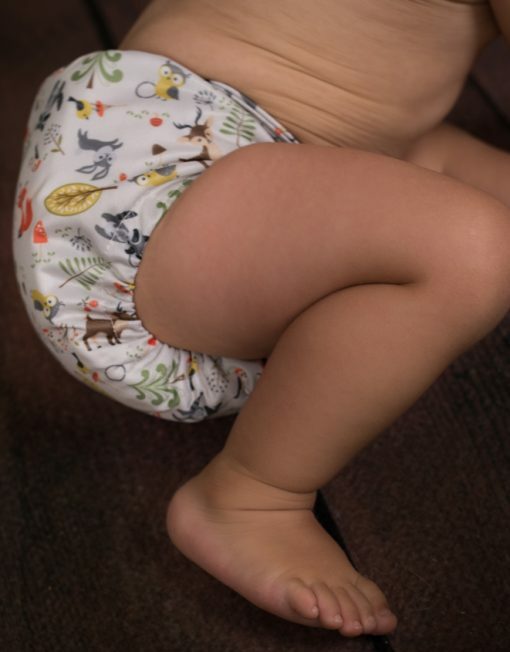 • The absorbent part (bamboo viscose and organic cotton) is topped with a polyester stay-dry fabric that protects the baby’s bottom from moisture. • The diaper has three levels of absorbency: the bottom layer of the diaper, the sewn-in layer and the detachable mini-insert. • The detachable mini-insert can be removed for newborns. We recommend you to put it back in the diaper at about 4-6 weeks. • Store dry between washes. • Use a soap recommended for reusable diapers. Proudly made in Canada with 100% Canadian fabrics.